One of the reasons I enjoy being a guest on The BeanCast is Bob Knorpp’s expert presentation and handling of important marketing topics. This week’s show is a classic. We begin the hour with a robust exchange about the disconnect between what marketers think customers want from digital experiences and what customers actually want. From there, we discuss ad blocker technology and its impact on publishers; Burger King’s new TV ad that speaks not to people but to a machine (Google Home); and finally we admit that “the internet’s reaction” to the new Pepsi ad starring Kylie Jenner was a form of tunnel vision, as many people actually like the ad. The opening topic relies on data from a new study by IBM’s Institute for Business Value. IBM surveyed upwards of 600 executives from a range of global businesses currently introducing new digital customer-experience (CX) tools. 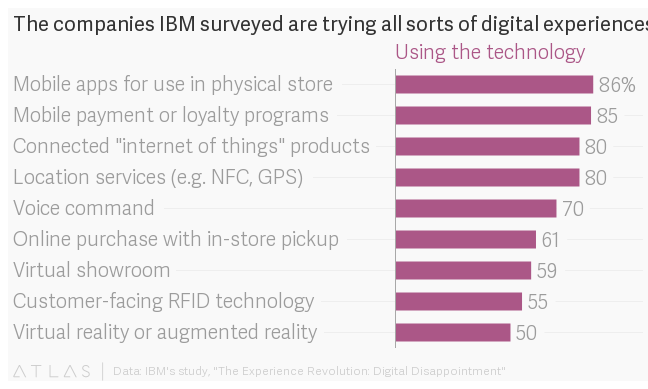 IBM also surveyed more than 6,000 consumers about their attitudes and experiences with digital interactions. It then compared the responses of the two groups to see how well they aligned. The result: They didn’t match up well at all. Executives, for instance, believed the top two factors driving people to use digital customer-experience technologies were a desire for more control over the interaction and a general increase in digital savvy. The top two driving factors consumers identified, however, were speed and convenience. I believe one of the reasons for the disconnect is cultural bias. MBAs in the executive suite hire hackers to build them shiny new objects, without fist hearing from the proposed customer base. How does anyone know the audience will be receptive to the new branded technology solution, without first asking? The Jobsian “invent it and they will come” philosophy belongs in R&D, not marketing. To move the digital customer experience needle, brands will need to invest in qualitative research and cultivate a culture of active listening to help inform decisions. Hire data scientists to parse the findings, and follow up with cultural anthropologists who can help make meaning from the findings.